Authored by Eileen Adams Agents of Change, as the title suggests, is a book that serves to explore how the author’s innovative initiatives have helped to shape government thinking, and subsequently have effected change art and design educators’ practice both in the UK and internationally. Published by Loughborough Design Press, this book sits within a suite of texts that each make a significant contribution to global design education research, and design theory. As such this book is of potential interest to policy makers, educational researchers and those with an interest in, and concern for, the educational and cultural development of visual literacy including institutions, organisations and charitable trusts. This text is also intended for teachers, student teachers, teacher educators, lecturers working in schools, colleges and other settings, and would prove valuable as a resource for the instigation of discourse and wider debate on the development of art and design within the context of educational settings. The book charts a logical journey, with the author guiding us carefully and thoughtfully through each of the ten chapters and projects contained within. This adopted approach contributes to the books ‘flow’ and engages the reader in the authors personal life journey. Chapters are sub divided to aid understanding, with each incorporating sections that in some way describe the projects context, partners, sometimes its struggles and challenges, the outcomes and impact. Within each chapter the author gives a clear and honest reflection of her perspectives and perceptions whilst working on the project at the time, and then at the end of each chapter (highlighted in lilac shaded areas) she provides an overview of the chapter with a summary ‘reflection’. Throughout the book, the authors recollections are lovingly supported by a series of delightful (and quite often nostalgic) photographs that capture moments in time. These are accompanied by numerous reproductions of work by students and children which include illustrations, sketches, models and drawing. Whilst not essential, I do think that having an understanding of the authors ontological position, is beneficial to the reader. Therefore, I would suggest that to get the very best out the book it needs to be read in order, although having read it through it would be easy to dip in and out of the text. There are particular chapters that work well together, for example Chapter’s three and four. In utilising the book with students, for example to instigate debate, it would be best if these are read together, or at least explained to the students in advance. I would imagine this book will be readily available to anyone who would wish to read it via libraries and so forth, however should a reader wish to purchase their own personal copy the book is reasonably priced and not prohibitive in cost for purchase of either the hard or paperback edition. 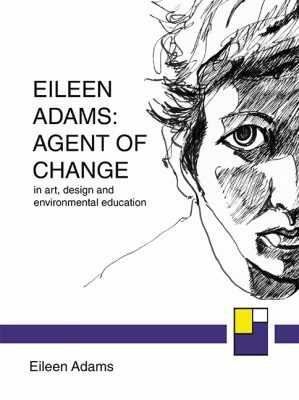 Eileen Adams: Agents of Change is a timeless publication. The authors initiatives have undoubtedly resulted in significant changes to both local and national government thinking, and have helped to shape developments in art and design educators’ practice both in the UK, and internationally. Thought provoking on numerous levels, and I have no doubt that many elements will almost certainly cause the reader to stop and consider their own art and design education practice. This book is easy to read and I would recommend it as worthwhile reading for any parties interested in furthering their understanding of art and design education.